We are a professional photography services company based in Kolkata , with branches in 9051903769 . We have been running a professional photography business for 6 years, specializing in Brahmin Wedding, Couple Portraits, Pre-wedding Shoots, Engagement, Reception, Bengali Wedding, Bridal Portraits, Indian Wedding, Candid Wedding, Wedding, Kindergarten, School Events, Kids Portraits, New Born, Birthday, Graduation Ceremony, Babies & Kids, Adventure, Destination/Sights and Travel photography. We undertake customized photography requirements. Some of our products and services include Poster, Lamination, Frames, Promo Videos, CD / DVD, Coffee Table Book, HD Highlights, Shortfilms, HD Videos, Calendar and Photobook. We provide services in West Bengal and All Over India. We are proficient in Hindi, Bengali and English. Very accommodating. Friendly. A lot of reviews have done during album & video editing. Overall experience was superb. Photo album & wedding treasure was just awesome. He is too good in his work. Very Helpful. Friendly, so being an unknown person it would not be at all difficult to shoot with him as client. He will be available for you at any time. Photography is very good... Especially candid pictures are the most amazing clicks...All the best for your photography ..Good pictures becomes tomorrow'r memories and the memories are the ones which we see and smile and cherish it for lifetime ?? Received good and quality service. He has many creative ideas and is very accommodating. During creating and editing the album and wedding video, we had many discussions and reviews which helped to create perfect wedding memories. I was glad to have him as my weddings photographer. Overall experience was superb with the photographer and his team. I shall definitely refer him for any occasions or events. His work was mindblowing. Very detailed orinted photographer. When Anirban clicks, the whole point of taking pictures is so that you don’t have to explain things with words. Anirban always try to provide not only best photograph but plenty of value added service to optimize his client's satisfaction. All the best Anirban for your future endeavours. Perfect what I’m looking for my wedding. As I’m a typical bong guy I’ll prefer natural moments than all planned shoot,as required, his work show the intimacy, love, and natural memories what we all desires. Thank you for the such gift. Anirban captured stunning photos on our wedding! Offers the perfect mix of creative and professional service. Extremely patient and friendly. Received the pictures in a week. Highly recommended! Good work. Very friendly and professional both. Very adaptive and takes feedback in the right attitude. Would request you to always check the venue of each event in a marriage beforehand and position accordingly to get the best shots. If it is sudden then the best shots might get missed due to lack of proper space. Very patient, listens to the every demand from client, never misses his deadlines and last of all he is a very good human being. Keep up the good work. Wish him every success in his life ahead. Excellent snap taken by Anirban Bhowmik and his team. We are very pleased this creative work. We are already recommended his name to our family members and friends. The photographs arrangements is too good. One of the best experiences during my wedding. He became a family member for us, and made the entire process so much smoother. Absolute gentleman and a splendid photographer! 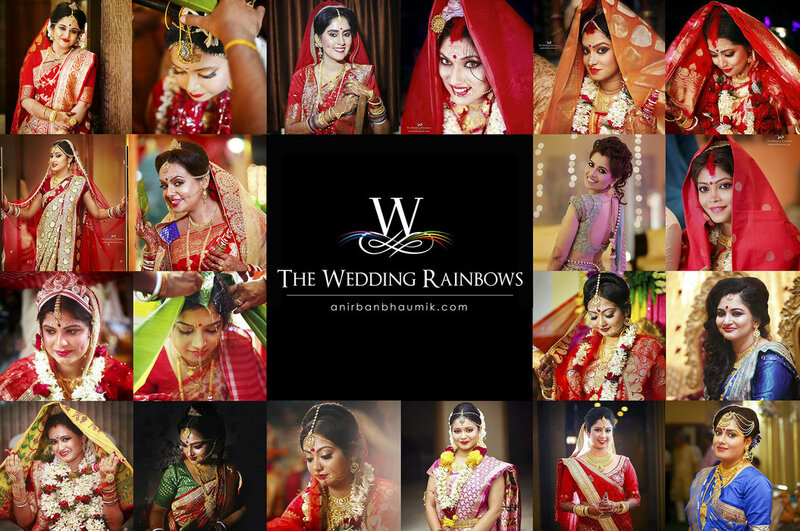 Anirban Bhaumik's "Wedding Rainbows" was a choice I'm glad we decided for our wedding and reception. I'm thoroughly impressed and overjoyed by their work. Your message was successfully sent to Anirban Bhaumik. The Photographer may contact you soon.